Xiaomi Mi 8 Youth Edition Twilight Gold Color Variant Officially Confirmed - Playfuldroid! Xiaomi has released a new teaser video for the Mi 8 Youth Edition that will be unveiled on Sept. 19. The video confirms that the handset will be arriving in an attractive color gradient of Twilight Gold. The teaser video is available in the source link. 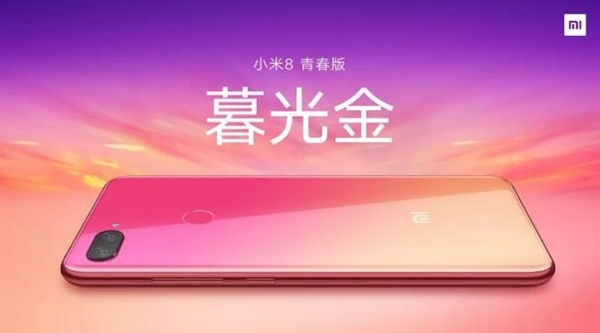 The screenshot of the video reveals the color changing design of the Mi 8 Youth Edition smartphone. The eye-catching Twilight Gold variant of the Mi 8 Youth boasts a pinkish hue at the top and appears gold at the bottom half. The Xiaomi Mi 8 Youth Edition is slated to go official on Sept. 19. The entire specifications of the smartphone has been already revealed through its TENAA listing. The Mi 8 Youth Edition is expected to arrive with an LCD screen of 6.26 inches. The notched display of the phone produces Full HD+ resolution and an aspect ratio of 19:9. As seen in the above image, the handset is equipped with a rear-mounted fingerprint scanner. The Snapdragon 710 chipset powers the smartphone. It is expected to arrive in variants such as 32 GB storage + 4 GB RAM, 64 GB storage + 6 GB RAM and 128 GB storage + 8 GB RAM. The handset is packed with 3,250mAh battery. It is likely to arrive with a starting price of 1,999 Yuan ($290).